We are living in the age of popcorn content. 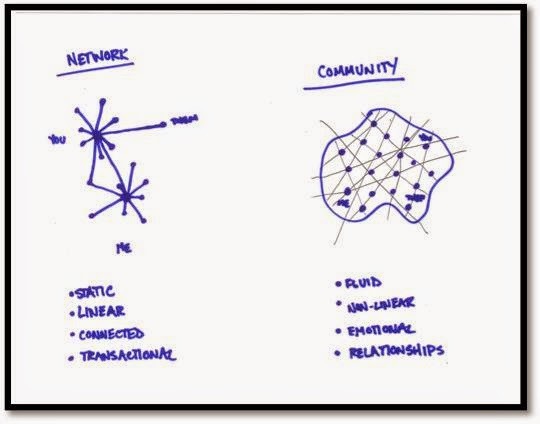 I was convinced of this when I recently came across this napkin illustration in LinkedIn's publishing platform, describing the differences between a social network and a community. It paints the differences in broad, simplistic strokes, reminding us how often we succumb to the temptations of a good-sounding narrative. Why bother probing into the dynamic nature of social networks when there is a convincing story to be told about how community is all about relationships and networks have to contend with only transactions? Today, every business worth its salt is gung-ho about building communities in the Web. In my consulting engagements, I have often observed that the glamour and pervasiveness of social networks and online communities in today's digital age makes people barely conscious of its mechanisms and the subtle difference between the two. I use the word subtle consciously here as communities and social networks are not mutually exclusive.They co-exist and overlap with each other. Here is my attempt to distill my understanding of the differences between social networks and online communities. I am indebted towards the works of Dr.Michael Wu which provided me the necessary foundation for my understanding. 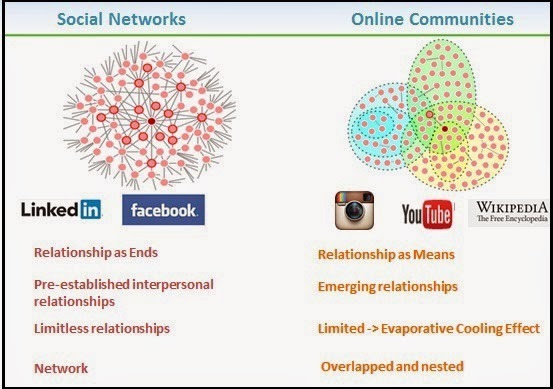 Relationships form the nucleus of social networks and communities. The difference between these social structures stem from the way people relate to each other. Social Networks are formed by “pre-established interpersonal” (to borrow Dr.Michael Wu’s words) relationships and therefore they are treated as ends in themselves. In the case of online communities, people relate to each other over common interests /passions/curiosities, even when they don’t know each other, and therefore relationships are treated as means towards pursuing their collective interests. Naturally, as relationships build and mature inside those communities, it merges with the individual’s social network. To explore how relationships occur over social networks and online communities, let us first understand the life-cycle of relationships. This diagram from Lithium Blog would help you understand this better. At the risk of stating the obvious, this life-cycle holds true for these two mechanisms which cultivate relationships. The first stage in the life-cycle consists of building weak ties. Weak-ties are formed in communities shared in common among members. Weak-ties are formed in social networks by their degrees of separation. Although it is easy to get carried away by semantics, weak-ties are equally valuable as the strong ties, as their sheer number and diversity drive the powerful forces we take for granted in crowd-sourcing. 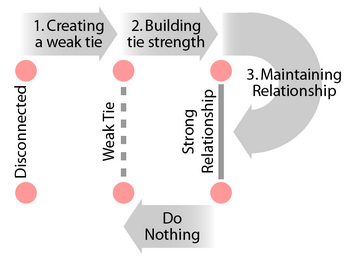 In the second stage, tie strength is built through cultivation of weak-ties into strong relationships. Means are necessary for achieving the ends. Communities are necessary to build and maintain the strong ties of relationships evident in social networks. If you study the evolution of popular social networks like Facebook and LinkedIn, you would notice that they started off as exclusive communities for universities,colleges and companies and later evolved to become social networks of staggering reach extending all over the globe. With this knowledge, I am sure, you would be able to appreciate why communities of Facebook/LinkedIn groups and Facebook fan pages are essential elements inside social networks. The third stage in the life-cycle should also be clear by now as it is necessary to ensure that the strong relationships do not erode into weak-ties. This term comes from an excellent essay by Eliezer Yudkowsky which explores a commonly observed phenomenon in group dynamics, through the metaphor of a naturally occurring phenomenon among hot atoms,commonly observed in physics experiments. “[Evaporative Cooling Effect] occurs when the most high value contributors to a community realize that the community is no longer serving their needs any more and so therefore, leave. When that happens, it drops the general quality of the community down such that the next most high value contributors now find the community underwhelming. Each layer of disappearances slowly reduces the average quality of the group until such a point that you reach the people who are so unskilled-and-unaware of it that they’re unable to tell that they’re part of a mediocre group." Anyone designing a social product today faces the onerous challenge of solving the problem of evaporative cooling. This dynamic also helps us in understand the complexities involved in designing an online community for openness. Although openness is often strongly desired to precipitate network effects, it is a major driver of “Evaporative Cooling effect”. As you can see,this is a complex topic and I’ve barely scratched the surface. I’d be happy to explore some of the topics that were touched upon in this post, in greater detail, depending your interest level.Do share in your thoughts/comments as well. I’d love to hear your views. A concise version of this post was published earlier in LinkedIn.